Vizag Steel Plant Recruitment 2017 Notification released. Apply Online for 19 Vizag Steel Junior Trainees for Instrumentation Branch Jobs. The application submission dates available from 17th July 2017. So, all the candidates should submit the application form before 31st July 2017. Further details like RINL Vizag Steel Plant Vacancy, Vizag Steel JT Eligibility, Exam date, Vizag Steel Plant Jr Trainee Syllabus, Previous Papers, etc. are mentioned in detail below. Good news!!! RINL-VSP Latest Notification Released to hire candidates in Instrumentation Branch. As per the recruitment details, there are 19 Junior Trainee posts are vacant. So, it invites Online Applications from the eligible candidates those who satisfy the eligibility criteria such as educational qualification & age limit. This is the good opportunity for all the job seekers those who are looking for the latest vizagsteel.com Plant Recruitment. Just follow the below information and get the complete details like Vizag Steel Plant Educational Qualification, Age Limit, Selection Process, VSP JT Exam Dates etc. No of Vacancies: 19 Posts. Candidates those who have Possessed the SSC with Full-Time ITI/ Diploma in Engineering are only eligible to apply for this VSP Jr Trainees Recruitment. Note: Female Candidates are also Eligible to apply for this RINL VSP JT Recruitment. Please follow the official notification for Age Relaxation Details. The VSP Officials will recruit candidates by conducting the Written Test followed by the Certificate Verification. The Selection process details are enclosed below. The Vizag Steel Plant Exam will be held on 20th August 2017. Rs. 10,700/- During First Year Only. Rs. 12,200/- For Remaining Period. Note: On satisfactory completion of training, the shortlisted candidates will be appointed as Technician. The minimum Basic Pay of Rs. 16,800/- in the pay scale of 16,800-3%-24,110/- (S-3 Grade). The main step to apply for the Vizag Steel Plant JT Application form is to pay the application fee. The fee details are attached below. For more details please follow the official advertisement by click on the below link. Finally, all the eligible candidates may apply for the Vizag Steel Plant Recruitment by click on online application link which is enclosed below. The last date to apply for the VSP JT Application form is 31st July 2017. 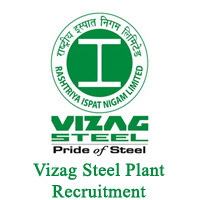 Rashtriya Ispat Nigam Limited – Visakhapatnam Steel Plant (RINL-VSP) has recently released a notification with Advt. no. 03/2017. The Vizag Steel Plant Junior Trainee Recruitment 2017 was issued to fill the vacancies of 736 Jr Trainee and Field Assistant Trainee posts. So, the Interested candidates should go through the Recruitment Notice carefully before applying for the post and ensure that they fulfill all the eligibility conditions. Candidates selected under this Vizag Steel Plant JT Recruitment 2017 should undergo training for a period of 24 months. Further details regarding this Vizag Steel Plant Recruitment 2017 are mentioned in detail below. For age relaxation details, click here. Jr Trainee: Candidates must have passed SSC with full time ITI/ Diploma in Engineering in Mechanical/ Electrical/ Metallurgy or in the relevant trade with a minimum 60% marks. Female candidates are eligible to apply in Electrical branch only. Field Asst Trainee: Aspirants must possess Matric /SSC from a recognized Board to apply for Vizag Steel Field Assistant Trainee Recruitment 2017. Only Male candidates are eligible to apply for this Steel Plant Vizag Jobs. Selection Process: Candidates applying for Vizag Steel Jr Trainee Recruitment 2017 will be selected based on the following process. Physical test (only for Field Assistant Trainee posts). Application Fee: Aspirants must pay the application fee of Rs. 300/- to apply for VSP Junior Trainee Recruitment 2017. One must deposit the fee in “RINL Recruitment Account No. 30589461220” at any of the core banking branches of State Bank of India in Challan generated during registration. No other modes of payment are accepted. Pay Scale: After successful completion of training, Junior Trainees will get 4.7 Lakhs per annum for S-3 grade and Field Assistant Trainees will get 4.38 Lakhs per annum for the S-1 grade. Starting date for Online registration: 8th June 2017. Closing date for VSP Trainee online registration: 21st June 2017. Availability of Admit Cards: 3rd July 2017 to 9th July 2017. Written exam date: 9th July 2017. Release of Vizag Steel JT Answer Key: 10th July 2017. Last date for receipt of applications: 12th July 2017. Release of Final Answer Key: 19th July 2017. Vizag Steel Plant Junior Trainee Results: 22nd July 2017. All the eligible candidates may apply online for this Vizag Steel Plant Recruitment 2017 between 8th June 2017 to 21st June 2017. Click here for Instructions to apply online for these Vizag Steel Jr Trainee Jobs. The Rashtriya Ispat Nigam Limited has recently released a notification under the Advertisement number Advt. no. 02/2017. Vizag Steel MT Recruitment 2017 was issued to fill the vacancies of 233 Management Trainee and Junior Medical Officer Posts. People who were looking for Central Government Jobs can utilize this opportunity. Only those candidates who have done Bachelor’s degree in the relevant field are eligible for this Vizag Steel Plant Recruitment 2017. Vizag Steel Plant Jobs is the wonderful opportunity for the individuals who wish to work with the Andhra Pradesh Government. Here on this page, we have provided the No. of Vacancies available, Age limit, Age Relaxation, Important dates, application fee, etc. of the Vizag Steel Plant MT Recruitment 2017. Aspirants can also download the Vizag Steel Plant Management Trainee Notification 2017 in the pdf format below. Hence read the complete article and apply for Vizag Steel Management Trainee Jobs before the deadline. Rashtriya Ispat Nigam Limited commonly known as RINL, the corporate entity of Visakhapatnam Steel Plant is a Navaratna PSE under the Ministry of Steel. Visakhapatnam Steel Plant also knew as Vizag Steel is the first Shore based Integrated Steel Plant in the country and is known for its Quality Products and Customer Delight. Every year, the board releases various notifications to recruit the skilled and dynamic persons in and around the country. Now the Vizag Steel Plant is inviting online applications from eligible candidates for the recruitment of Management Trainee and Junior Medical Officer (JMO) Posts. Hence all the candidates should go through the Recruitment Notice carefully before applying for the post and ensure that they fulfill all the eligibility conditions. All the postulants should apply online only through the official website of Vizag Steel Plant Management Trainee Recruitment, i.e., www.vizagsteel.com from 17.05.2017 to 31.05.2017. Applied candidates will be selected based on their performance in the written test and interview. The Eligibility criteria of Vizag Steel Plant Recruitment 2017 specify the age limit, educational qualification, and nationality of the candidates. So, before applying for this notification, one should read the eligibility criteria of Vizag Steel MT Recruitment 2017 thoroughly to know whether they are eligible or not. One can check the complete details of Age Limit and Qualifications of these Vizag Steel Management Trainee Jobs from the below sections. The age limit of the candidates applying for Vizag Steel Plant Recruitment 2017 is as follows. However, age relaxations are applicable for reserved categories as per the rules of the state government. Aspirants who are eligible for the upper age relaxation under this Vizag Steel MT Recruitment 2017 must hold a certificate for the reservation category. For Management Trainee posts, Maximum age: 27 years. For Junior Medical Officers, Maximum age: 30 years. Management Trainee: Aspirants applying for Vizag Steel MT Recruitment 2017 must have done Bachelor’s degree in Engineering or Technology with minimum 60% aggregate marks from a recognized University or Institution. For Management Trainee (F & A): Postulants must have done Bachelor’s degree in the relevant field with minimum 60% marks or candidates should have passed final examination of ICAI or ICWAI. Junior Medical Officers: Candidates must have completed MBBS degree from a recognized Institution or University or Medical College recognized by Medical Council of India (MCI) to apply for Vizag Steel Plant Recruitment 2017. Final year students who could submit original mark sheets and provisional certificate by the time of interview only need to apply. Before applying for Vizag Steel MT Recruitment 2017, one should be aware of some details such as the selection procedure, pay scale, application process, examination fee, etc. For your convenience, I have provided all those details below. So, let’s have a look at these in the below sections. The officials will shortlist the candidates of Vizag Steel Plant Recruitment 2017 based on their performance in the following rounds. Aspirants applying for Vizag Steel Plant Management Trainee Recruitment 2017 need to pay the application fee in offline mode using Fee Payment Challan/ Pay-in-slip. After filling the basic details, one can download the challan from the official site, i.e., www.vizagsteel.com. One should pay the application fee in any of the core banking branches of State Bank of India to the “RINL-VSP Recruitment Account No. 30589461220” in the prescribed preprinted Challan. The officials will accept no other modes of fee payment. So, deposit the Vizag Steel Application fee as per your category before the last date. General and OBC candidates: Rs. 500/-. These are the list of exam centers where the officials will conduct the written test of Vizag Steel Plant Recruitment 2017. So, candidates should select any of these cities as the test center carefully while filling the application form. Because the officials will not accept the change of the exam center. Training & Probation period: Candidates selected as Management Trainees in Vizag Steel Plant will be placed on training for one year. Hence, after successful completion of training, the candidates shall be placed on probation for one more year. Answer key release date 25/06/2017, after 5.00 p.m. The online application of Vizag Steel MT Recruitment 2017 is available on our site attached below. The Vizag Steel Apply Online link will be active from 17th May 2017. So, the officials will be made available this online application to all the candidates on their official website www.vizagsteel.com from 17th May 2017 to 31st May 2017. So, one should fill the Vizag Steel Management Trainee Online Application form between these dates only. Kindly open the Vizag Steel Online application of the relevant post from the given link and also submit the application before the deadline. The procedure of applying online for these Vizag Steel Plant Management Trainee jobs is mentioned in detail below. Hence follow these steps and make your online application process simple and hassle free. How to Apply for Vizag Steel Plant Recruitment 2017 online? Firstly, visit the official website of Vizag Steel Plant, i.e., www.vizagsteel.com or the direct link below. Click on Careers button available at the top of the homepage. Search for Vizag Steel Plant Recruitment 2017 link. Now click on notice on relevant posts and read the notification carefully. After that fill the Vizag Steel Plant Online Application 2017 with the correct details. Upload scanned copies of recent passport size photograph, signature, and required documents in the given format. Make the fee payment as per your category in online mode. Finally, click on Application preview and take the printout of the Vizag Steel Trainee Application form for future use. The direct link to download Vizag Steel Plant Management Trainee Notification 2017 is given below. So, download the notification and apply for Vizag Steel Plant MT Exam 2017 today. If you found this article about Vizag Steel MT Recruitment 2017 was helpful for you, please do share with your friends. Moreover, if you have any doubts, feel free to ask your queries in the comment section below. Our team will reach you earliest and solve it for sure. Also, Stay tuned with our www.entranceexams.io site for more details about all Entrance Exams in India. sir please add challana link. I have completed my B.tech in Metallurgy during 2015.
am I eligible for applying Management Trainee post? Yes You are eligible for MT Post. Sir i am a Muslim and belongs to shaik BC- E category and my caste does not comes to OBC but belongs EBC will I apply junior trainee post under OBC category or I will apply in general category. what are required certificates for certificate verification? ?